To get started with Discover, you'll need to connect your Twitter and/or Instagram accounts to enable us to search on your behalf. To use Discover, you'll need to connect an account for the network you're trying to search. When you first arrive, you'll be presented with an opportunity to connect your handle. Discover is all about searching. What you can search for depends on the platform you're searching, but let's start with something simple: hashtag search. On both Twitter and Instagram, we can search for posts that contain a particular hashtag. For example, say you want to find influencers and posts related to mommy bloggers. You might search for #mommyblogger. Put in the search box and press Go! 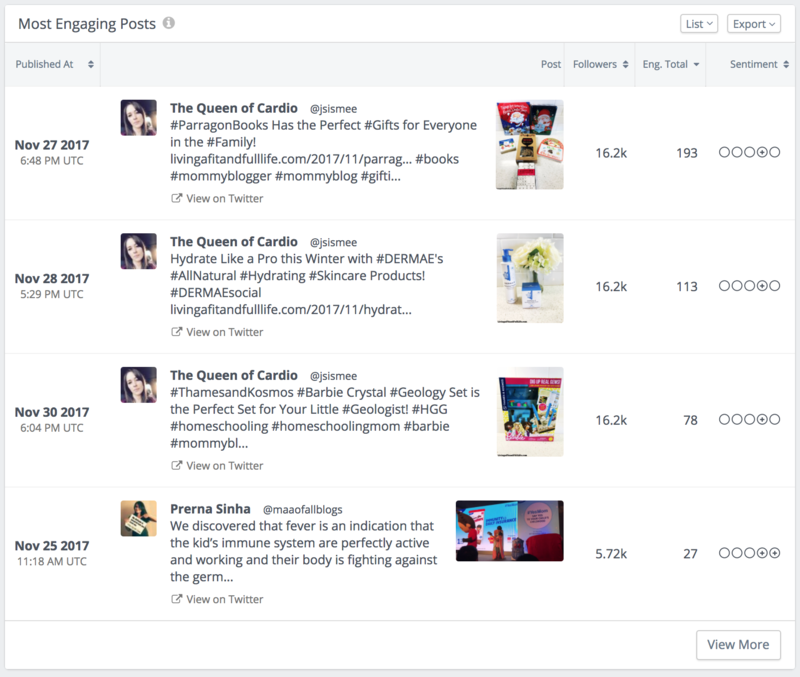 You'll be presented with recent tweets or posts that contain #mommyblogger. 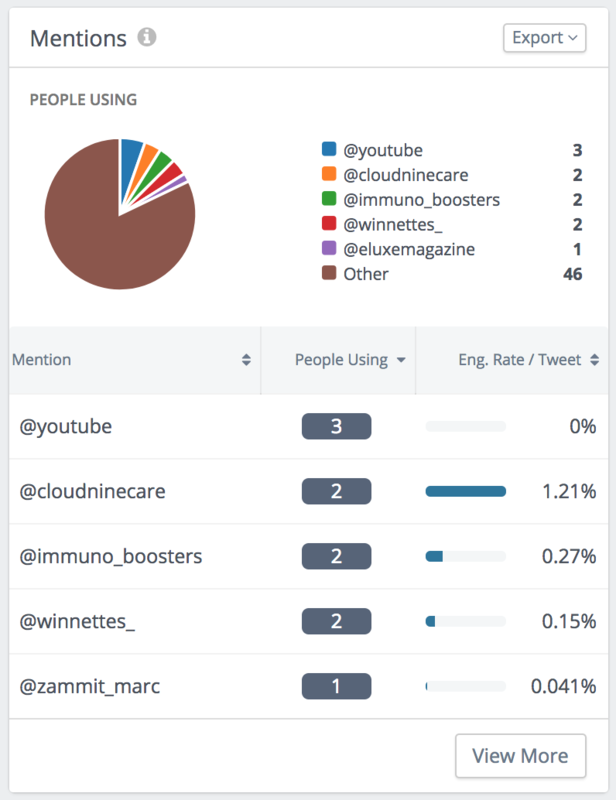 To help you get started, Discover will analyze your landscape to suggest searches about popular hashtags or competitors. Just click one of them to get started. When we run a search, we're looking for recent content that matches your request. It is important to note that Twitter and Instagram search function differently. Understand what you're getting back is useful in interpreting the results. For Twitter, Discover uses the standard Twitter Search API, which enables search on the last 7 days worth of Tweets. Any Twitter search you run in Discover will only look over that time range. To keep your analysis snappy, we also limit the number of tweets in an analysis to 1,000. If you're searching a very popular query (hashtag, handle), you might hit the 1,000 limit over a time range that covers a few hours (or minutes!). For Instagram, Discover uses the Instagram hashtag search API. This enables us to find posts using the hashtag you're searching. There is no time limit to what Instagram will return, and we limit the result set to about 500 posts. Those 500 posts could cover hours, days, or weeks depending on the popularity of the hashtag you're searching for. To see what you've gotten back, look just under the search box in the results page. You'll see a display showing the number of posts and time frame that the posts cover. Once you've made your search, you'll be presented with a full report of the search results, including analysis by the following groups. Here's an example, continuing with our #mommyblogger example from above. Let's take it a bit at a time. First, we get our search result summary in our At a Glance panel. Here, we can see that there have been 592 tweets in the last week containing this hashtag. 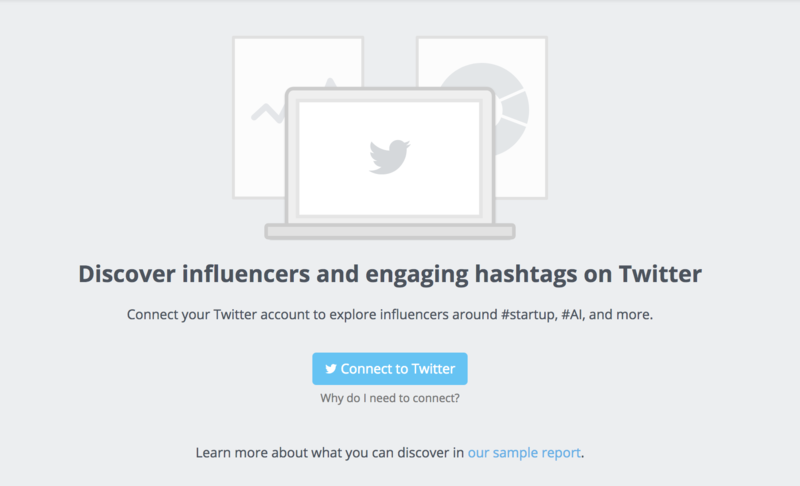 Around 227 users contributed these tweets, and their tweets earned an average engagement rate of 0.11%. The median follower count for influencers (accounts) using this hashtag is 509. Next, we get our influencer panel. Here, we have a list of influencers, sorted by their potential influence. 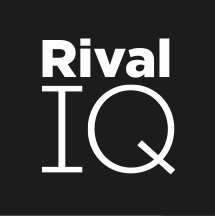 Rival IQ computes potential influence using engagement on data in this set of posts, follower count, and number of tweets to compute this score. This table is completely sortable, and you can view the full list by clicking the View More button in the lower right. Next, we have our Coincident Hashtag panel. This panel shows the most commonly used hashtags in this data set. 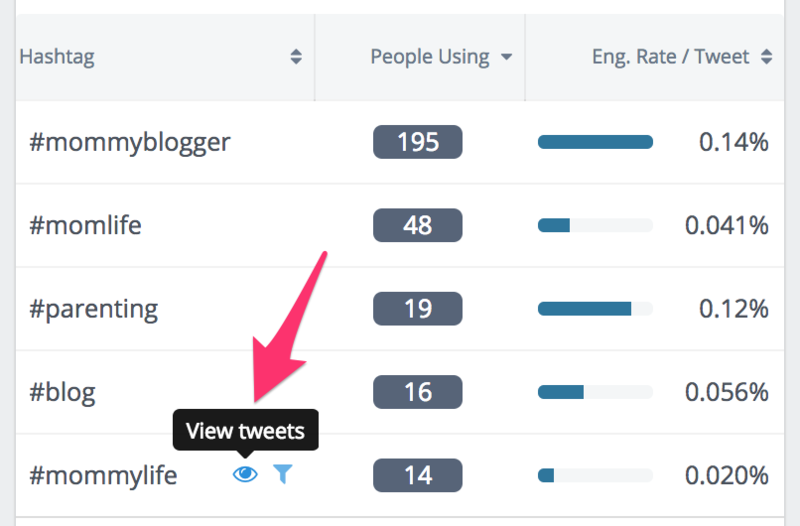 Pressing "View More" in the lower right will give you access to all of the hashtags and many more metrics to help your analysis. Next, we have the Mentions panel. This panel shows which handles were mentioned most commonly in the posts contained in this data set. The pie chart at the top of the panel gives a visual summary of the most mentioned handles. Pressing "View More" in the lower right will give you access to all of the accounts that are mentioned in this data set as well as many more metrics to help your analysis. Next, we have the Common Terms panels. On the left, we have Common Phrases, a panel that shows off common phrases found in the body of the tweets in this data set. Only phrases that have 3 or more uses will be shown here. 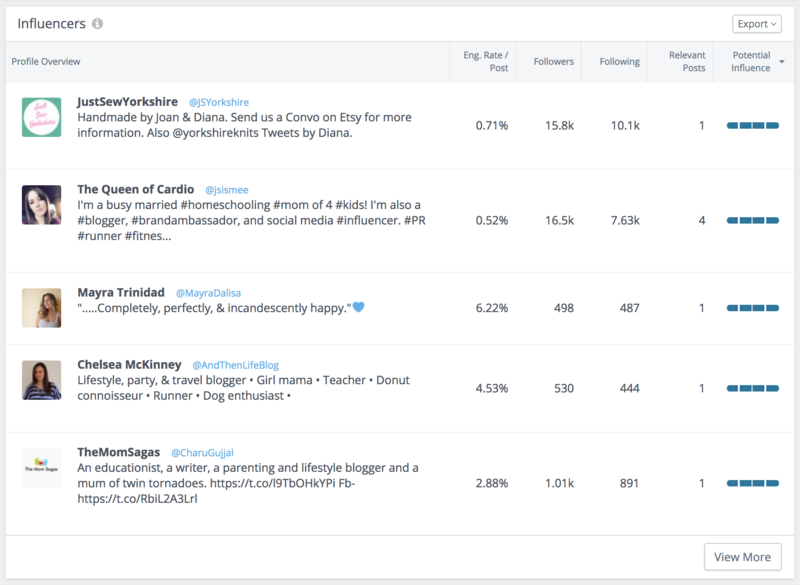 On the right, we have the Common Terms in Bios panel, which shows off common terms or phrases from the account bios for influencers in this data set. The last panel on the page is the Most Engaging Posts panel. This is a table of the posts returned by your search. It is sortable by many metrics. Use the "View More" capabilities in the lower right to access additional posts and metrics. 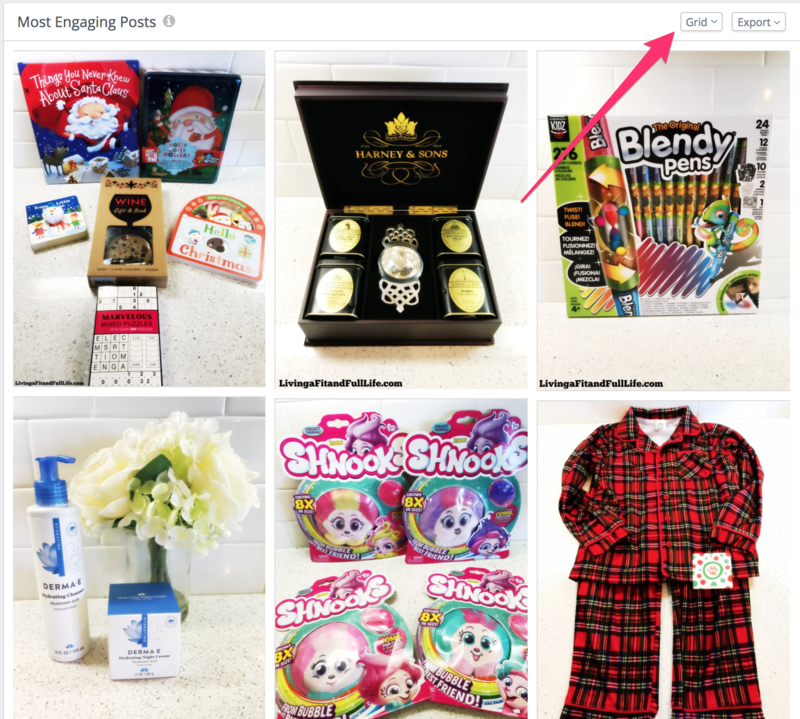 The Most Engaging Posts panel also features a grid layout for posts that contain images. Use the switch in the upper right to activate the grid layout. To see a preview of posts contributing to any row in your report, hover on the row to reveal a posts preview action. Look for the little eye icon, and click it to reveal some of the posts behind the data. Once you have your search results, you can filter them to get a better view of the data. Please note that filtering in the report does not search again against the platforms. Rather, it is filtering the result set you already have. 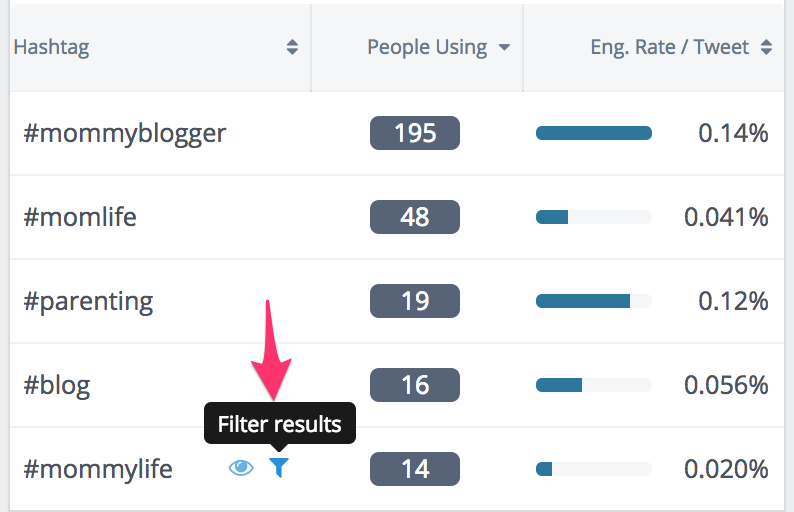 To filter you results set, hover on any row, and look for the filter icon. Clicking it will filter the entire dashboard to contain data that matches your selected filter. 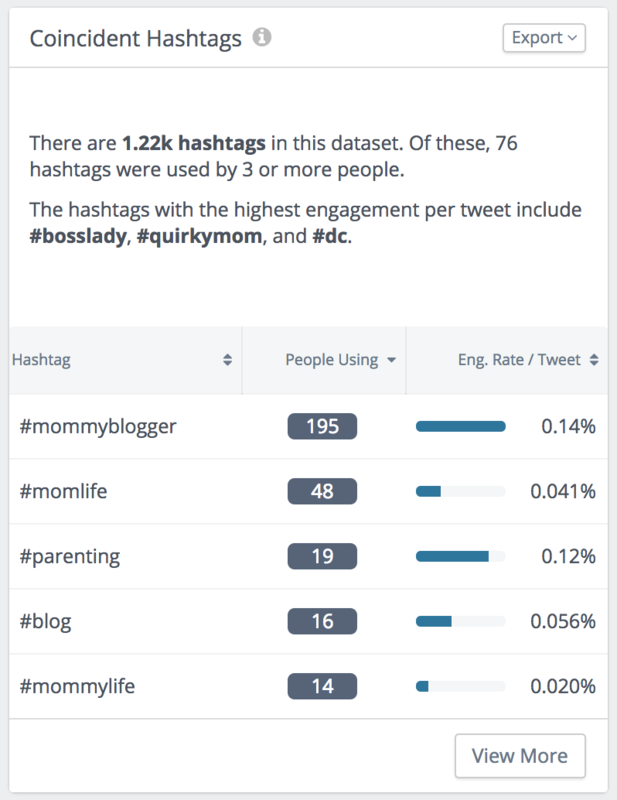 For example, in the screenshot below, I'm going to filter the entire #mommyblogger analysis to tweets that also contain #mommylife. Once you've activated a filter, you'll see it at the top of the page, next to the search box. Click the 'x' associated with the filter to clear the filter and return to your full data set. 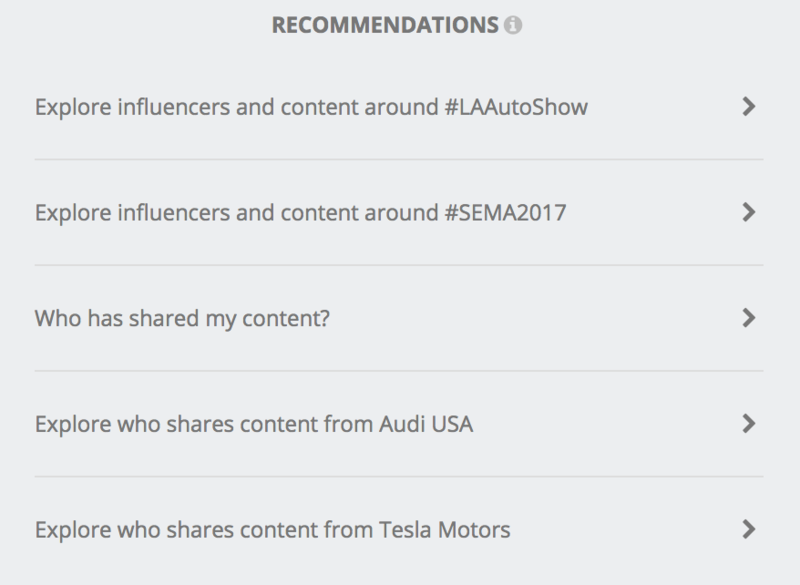 To analyze more deeply the tweets or posts from any account, you can hover on any influencer row to reveal the "Analyze account" action. This will open a new browser tab with a complete Discover analysis of posts from that account. On Twitter, this will analyze all tweets from that account during the last week. On Instagram, this will analyze the most recent 500 or so posts, spanning whatever time required to hit the 500 post limit. Twitter Search is very powerful and has lots of operators we can use to refine our search. We use their Standard Search API, and Twitter maintains a full reference to their search syntax. Some of the most common operators you might use would include the following. The search syntax for Instagram search in Discover is very basic.